The ocean harbours immense potential as a source of renewable energy, but accessing that energy can be damaging to marine species and their habitats. To balance healthy environments with green energy, a Draft Resolution on Ocean Energy will be considered at the 8th Meeting of the Parties to the Agreement on the Conservation of Small Cetaceans in the Baltic, North East Atlantic, Irish and North Seas (ASCOBANS), to be held from 30 August to 1 September 2016 in Helsinki. Wind, waves, tides and temperature differences in the oceans result in movement of water creating a vast store of kinetic energy that can be harnessed in various ways to generate electricity. Offshore wind energy installations are the most well-known and most visible, soaring above the water, but recently, tidal energy devices and mechanisms to harness wave energy have been developed. As renewable energy sources, these technologies are important in the efforts to mitigate climate change. However, collection of ocean energy does impact the marine environment. Collisions with energy collection devices, in particular with moving parts such as rotor blades, pose the largest danger to cetacean species. Animal behaviour may change in the presence of such devices; they may evade or avoid or be attracted to the machines. Underwater noise emitted by such devices also impacts species. The introduction of anthropogenic sound into habitats can be dangerous to animals, but it may also protect them from strikes by alerting them to the presence of the devices. Collection devices can change habitats by interfering with hydrodynamics and ecosystem interactions, among other ways. There are still more risks, including pollution from paints, but collisions present the greatest threat. The resolution’s introduction acknowledges that many of the risks to marine animals are poorly understood. 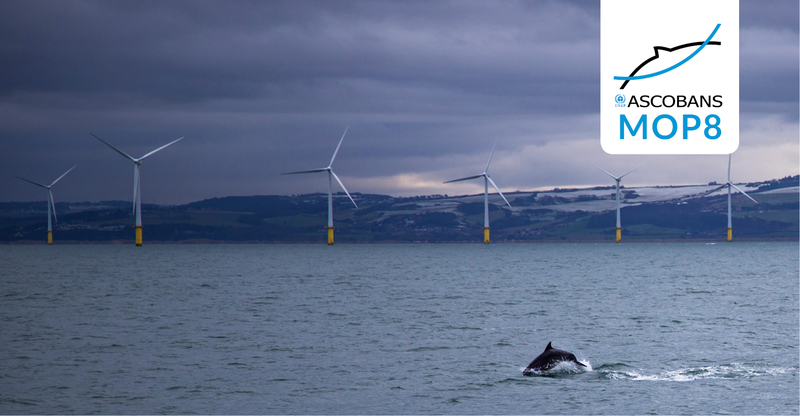 The resolution therefore calls for research into the impacts of ocean energy on cetaceans and porpoises throughout the lifetime of the energy capture installation. As also noted in the resolution, robust monitoring is crucial to understand effects on the habitat and on the abundance, distribution and behaviour of animals. Appropriate monitoring would enable the development of timely and effective mitigation strategies, while modelling would allow accurate calculation of the likelihood of strikes. Together, thorough Environmental Impact Assessments and marine spatial planning play key roles in illuminating the implications of ocean energy installations and in reconciling their use to the fullest degree possible with environment and biodiversity conservation efforts. Once adopted, the resolution will help Parties account for all possible impacts on protected species and alleviate as much as possible those impacts. The purpose of the resolution is therefore to encourage sustainable utilization of ocean energy through better information. The energy potential of the world’s oceans is immense. For example, water is 835 times denser than air, meaning that a 3-knot current has the same kinetic potential as a wind of 161 kilometres per hour. The utilization of this power can and should be balanced by careful consideration of effects on the marine environment and the many species that make their home in the oceans. ASCOBANS is the Agreement on the Conservation of Small Cetaceans in the Baltic, North East Atlantic, Irish and North Seas. It is one of the daughter agreements of the Convention on Migratory Species (Bonn Convention) and entered into force in 1994. Since then, its Parties have met eight times, now on a four-year cycle, to assess the implementation of the agreement and decide what measures to take for better conservation of the species protected under it. This article is part of a series showcasing some of the issues and resolutions to be discussed at the upcoming 8th Meeting of the Parties to ASCOBANS (MOP8).